As the season slides from summer into fall, it’s easy to get nostalgic for extra-long days, reminiscing the bounty of fruits and vegetables that warm weather brings. But what most people don’t know is that fall too, brings its own share of mouthwatering produce. Compiled from Eat This, Not That! here is a list of six foods that will help you shed some pounds before winter wedding season. Mushrooms are the type of fungi you want to find in your fridge. Rich in vitamins D and B, they’re a great addition to everything from salads to burgers because the texture mimics that of meat. Mushrooms are also rich in selenium, an antioxidant that repairs cell damage and helps the thyroid, says Jennifer Glockner, author of the Smartee Plate series. Cauliflower is an incredibly versatile swap for carb-laden, starchy foods. Grated cauliflower can take the place of rice, mashed cauliflower can stand in for mashed potatoes and tiny florets can substitute for noodles in mac-and-cheese. Bonus: “Cruciferous vegetables like cauliflower have shown to possibly help reduce the risk of certain cancers, namely prostate cancer, due to their high antioxidant activity,” says corporate dietician Alexandra Miller. High in fiber, these veggies can also help you feel fuller longer, leading you to consume few calories and, in turn, lose weight. Synonymous with fall, apples should be ubiquitous in your kitchen. They’re high in fiber, which keeps you fuller longer, and vitamin C, an antioxidant important for protecting gums and healing wounds by enhancing collagen production, says Glockner. Many of an apple’s nutrients are found in the skin, so wash it well and enjoy the whole fruit, adds Glockner. Buying organic apples is your best bet, because it’s one of the “dirty dozen” fruits and vegetables that contain a higher concentration of pesticide residue than other types of produce. This tropical fruit is the perfect way to satisfy your sweet tooth without bloating your belly. “One medium kiwi has about 60 calories, 100% of the vitamin C we need in a day, and more than half the potassium one banana has to offer,” mentions Miller. In addition to being low-cal, fruits rich in vitamin C help the body oxidise fat during moderate-intensity exercise, according to a study published in the Journal of the American College of Nutrition. Potassium also helps the body metabolise fats and carbohydrates. Pears are so sweet that it seems impossible they only contain about 100 calories each, but it’s true. This fall fruit is a good source of vitamin C and contains 6 grams of fiber per medium fruit (24% of your daily value). Pears help keep hunger at bay thanks to pectin, “a soluble fiber that attracts water and turns to gel, slowing down digestion,” says Glockner, “which may help to reduce blood cholesterol and reduce risk of heart disease and colon cancer.” Eat pears by themselves, or add them to grilled cheese sandwiches, salads, chutneys and salsas to lend a sweet kick. Though getting to a pomegranate’s seeds might be a challenge, it’s totally worth the effort. 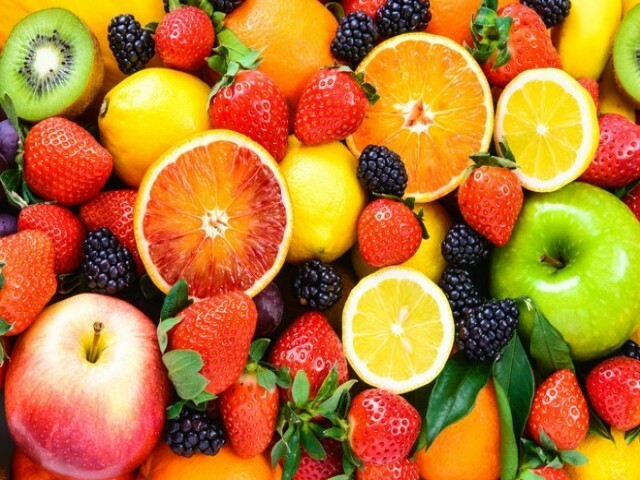 The sweet fruit is rich in vitamins including C and K, along with polyphenols, antioxidants that have been shown to reduce the size of fat cells and even keep them from developing! Pomegranate seeds are great as a topping in salads and to add a low-carb crunch in yogurts, cereals and other dishes.